Well my husband obviously had something else in mind because the next thing I knew he was talking film festival and Sedona. What! That’s not vacation…where would we eat in Sedona. And movies…don’t we watch enough of them at home…do we really need to drive two hours to the middle of nowhere to watch movies and eat crappy food. For the record I did not want to go on this “vacation” but after 20 plus years I’ve learned that sometimes (not often) I need to let my husband have his way and that most times he usually knows what he’s talking about. We set off last Thursday afternoon on what turned out to be an awesome long weekend at the Sedona Film Festival. Since this is a blog about food I won’t go into details about the festival itself accept to say that I loved it! Can’t wait to attend another one (is this really me talking) and I got to meet Michael Moore, Jerry Stiller and Robert Osborne from TMC, which was awesome!! More importantly the food; we had some really good food in Sedona. Our first night we went to a small place called Apizza Heaven. It reminded me so much of the mom and pop places we frequented back in Philly. 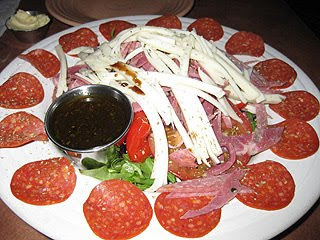 We shared a hand tossed pie and antipasto salad. Although I wouldn’t say this was anywhere near the best pizza it was decent and brought back some great memories of home. Breakfast on Friday was at NY Bagels and Deli. Not only did they have authentic NY bagels they also had tons of east coast pastries. The owners were 5th generation bakers from Brooklyn; how could you go wrong. They had the most delicious danish, thick slices of marble pound cake, and NY style cheesecake that looked incredible. Needless to say we took a bag of pastries back to Phoenix with us. Later that night we had dinner at Dahl and DiLuca. Although the evening started out rough (they sat someone ahead of us) it was made special by our waiter who adorned our table with rose petals and brought us out a complimentary platter of mixed appetizers. Included were cheese filled olives with a caper aioli, grilled focaccia topped with tomatoes and basil and some marinated kalamata olives. This was followed by a mixed greens salad and our entree; mushroom ragu over handmade pasta. Everything was very tasty but unfortunately we didn't save any room for dessert. The next day we wandered a little off the beaten path and found a great Italian market called A'Roma. (owned by the same people that own Dahl and DiLuca) They had a large selection of Italian specialties including: olive oils, pastas, pastries, and wine. We shared a mozzarella and prosciutto Panini, a freshly made mixed green salad, and homemade potato soup. This is definitely place worth seeking out. Dinner on Saturday was at Red, located in the Rouge hotel. We decided to sit in the bar and share a few small plates from the menu. Beef sliders, sweet potato fries, and a Mediterranean plate (definitely my favorite) which included hummus, feta cheese, cucumbers and kalamata olives. Vacation is over and I must admit we had a great time. Lesson learned...seek and you shall find...good food is out there...even in what I consider the middle of nowhere. Congratulations Laurie and thanks to all of you that participated! what a great place to chill though! I guess if I am in your shoes, I would be thinking of ..whhhyyy but so glad that it turned out to be a great experience for you and the food looks awesome. Guess the food hunter found great food everyone she goes! Thank you Theresa! I'm so exited to have a chance to check out this cookbook! Sounds like a great break! And some good eats! Sedona sounds wonderful. Although if you ever persuade your husband to vacation in NYC, you'll have to let me know! 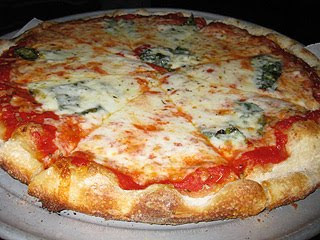 mmm, that pizza looks so great and cheesy! I've been to Sedona once, I shall remember all of this places you recommend next time. Thank you. And congratulation to the winner. I am sure she is very happy! What a great vacation! I'm glad that you were able to find some great East Coast eats in Sedona. I'm glad your hubby was right about Sedona -- it sounds like it was so much fun! That pizza looks incredible! Sounds like you had some great food! I would jump at the chance to go to Sedona any old time! The last time I was there was 6 years ago and it was wonderful, so zen like and warm. Sometimes our husbands know what there talkin about... sometimes!